Perennial, dioecious grass from rhizomes, the rhizomes extensive, sharp-tipped, sometimes more or less stoloniferous; stems solid, sometimes decumbent, 10-40 cm tall/long. Sheaths smooth except on the summits of the margins, the collars with or without long hairs; blades 2-4 mm wide, mostly in-rolled, smooth or soft-hairy to stiff-hairy on the upper surface; ligules about 0.5 mm long, the margins irregularly jagged, more or less fringed with coarse hairs, the fronts of the collars with many hairs, 0.5-3 mm long. Inflorescence a compact to loose panicle 3-8 cm long, the spikelets and their stalks obvious or the stalks not obvious; spikelets few- to many-flowered, the male ones yellowish, 7- to 16-flowered, strongly compressed, the female more greenish, 5- to 9-flowered; glumes shorter than the lower lemmas, unequal, the lower ones about 3.5 mm long, the upper about 5 mm long; lemmas membranous (male spikelets) or more or less firm-papery (female spikelets), about 3-6 mm long, the female lemmas harder. Sandy lake shores and moist alkaline meadows in the steppe zone (var. stricta) or coastal beaches and salt marshes (var. 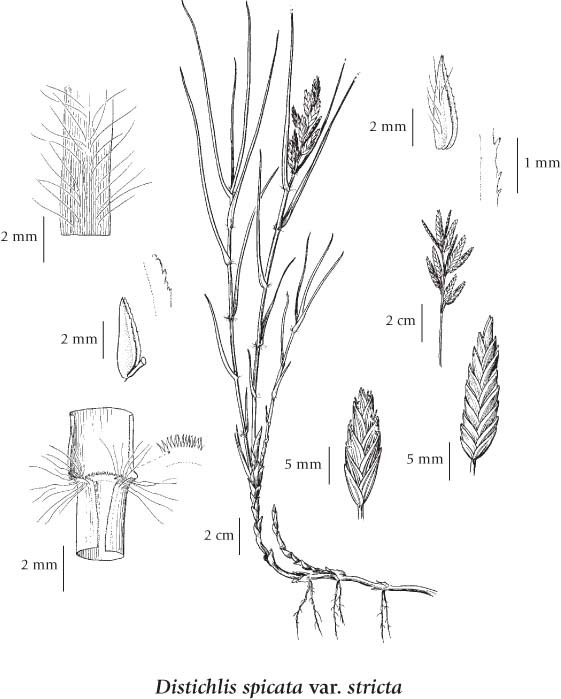 spicata); var. spicata - frequent in SW BC; var. stricta - common in SC BC; var. stricta - E to SK and S to MO, OK, TX and CA; var. spicata - S to CA, disjunct to E coast of North America. Distichlis spicata var. 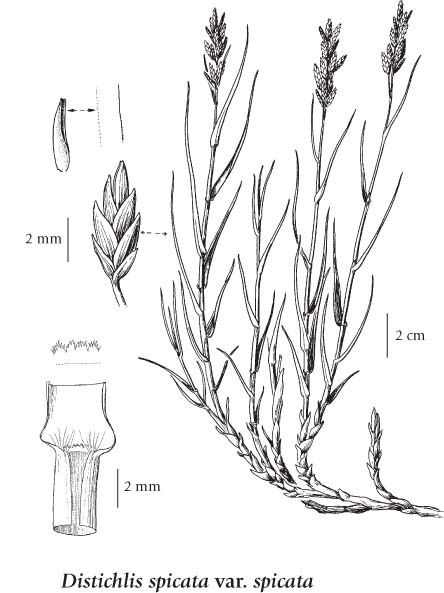 stricta (Torr.) Scribn. Distichlis stricta var. dentata (Rydb.) C.L. Hitchc.